with a hip hop that jumps like Cowboy Bebop. The Edo period, a time with feudal lords. Mugen, Jin, and Fuu, they're an awkward team. Smelling air for sunflowers, don't you see? I LOVE this anime, and you should too! I hope you enjoy Samurai Champloo! There's isn't a lot to say. Samurai Champloo is just an amazing show, with colorful and fun characters, plots and twists, and the soundtrack is just outstanding. Every episode is a new story with the main story progressing nicely with it. The dubbed version is very good too! One of the best; a true classic. Fantastic soundtrack, animation, character development, humor, atmosphere, and style--this anime has it all. For me, this show sits as an equal with greats such as Trigun, Cowboy Bebop, Gurren Lagann, Neon Genesis Evangelion, and many others. I would highly recommend. This show starts off with a bang right from the beginning and even though it is a simple plot the adventures that the main characters go through every episode are filled with life lessons and morals that can be related to in the real world during that time period. They're all very likeable and Jin and Mugen are in my top 5 anime swordsmen list. The soundtrack for this anime is so damn beautiful i have a multitude of the songs on my phone and I casually listen to them from time to time. If you are a fan of hip hop and smooth R&B music you will adore this anime. Each episode's plot could either be a comedy or a really deep message relating to the problems of the real world during that time. Episode 11 of this anime will always be one of my favorite anime episodes ever. Honestly, when I first heard of this one, I wasn't sure I would like it. But eventually, I decided to give it a go. THAT WAS A GREAT DECISION! After watching the first episode, I couldn't help but fall in love with this anime's soundtrack, plot, animation, characters, and epic fight scenes. This anime is honestly one of my favourites! Every episode, there was something new and enjoyable. This anime is also extremely funny and I was laughing all the way through to the last episode. There wasn't a single character I didn't like or couldn't relate to and I'm really going to miss watching Mugen, Jin, and Fuu's journey to find the Sunflower Samurai. This is an anime that I will definitely have to re-watch sometime in the future. If you're not sure about watching this anime, I will tell you right now, you won't regret watching it. Who knows, maybe this will make your favourite anime of all time list? This anime was a classic. Fell in love with the characters right away. Great story, great everything. If only there were more episodes! Character development was really solid, and the plot unfolded very very nicely. Jin, Mugen, and Fuu each have individual traits that strongly contrast yet their bond grows strong. Reminiscent of Cowboy Bebop in that sense. This anime is a masterpiece, the music is phenomenal, the characters are unique and their development is amazing. Seeing the relationship between Fuu, Mugen and Jin completely change through experiences and adventures. Very good anime, would definitely recommend. 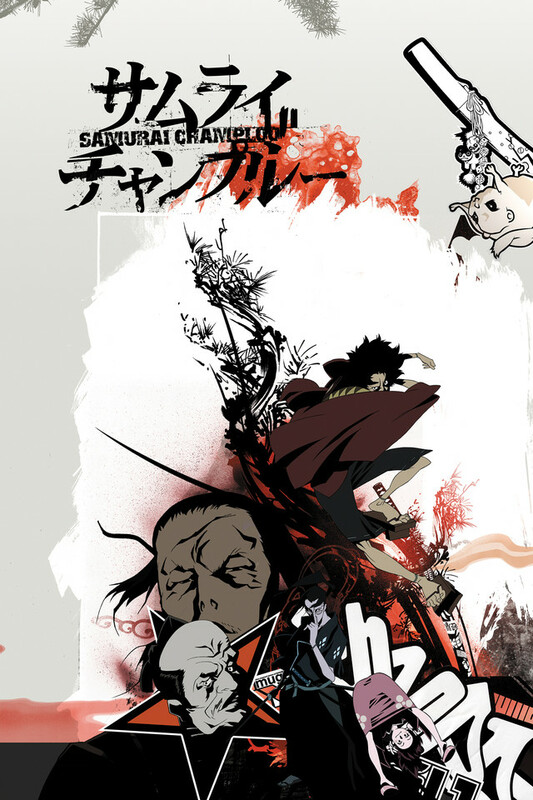 Samurai Champloo was one of those shows that shaped a generation of anime watchers in America in the mid-2000s. I was one of them. The amount of anime we had access to back then was exponentially smaller than it is today, so when we were introduced to Champloo, it blew our minds. Great art and animation, memorable characters, fun adventures, and an incredible soundtrack. the soundtrack mixed hip-hop with anime, and spearheaded a new wave of how anime was perceived in the West. It put the musician Nujabes on the map, and popularized the genre of "lo-fi" chill hip hop beats. This is essential watching for fans of Cowboy Bebop, as it is by the same creator, Shinichiro Watanabe. Samurai Champloo is a well-choreographed anime that incorporates hip-hop into the old Japan period. Every episode was either funny or gave a backstory into a characters life and made the connection with them stronger. I would recommend if you like swords or fighting. Second time I've watched it, and still really enjoyable. I love the art style and music. Sometimes the characters are really naive and get themselves into hilarious and dangerous situations, but in the end it's a great anime and I would recommend it.